I am still getting to know the world of recycling and I have come across a minor issue when it comes to learning the difference between recyclable items. I have several cat food bags (OK CAT Health & Taste Low Magnesium, 800g — I mention this because I hope there is someone who had previous experience with the brand, or "material" which the bag is made of) and thought those could be recycled, as well. Nevertheless, there is a symbol on the bag which confuses me and I would be very grateful if someone helped me solve the mystery I am dealing with here. Does this mean that the bag is both PET and PE or that this is neither PET nor PE and hence not recyclable? Or what? The logo means that the packaging consists of both PET and PE. Logos like this are common on packaging and are often (incorrectly) called 'recycling logos' or 'recycling codes'. Contrary to popular belief the presence of such a logo does not mean that the material is recyclable. Compostable plastic for example has code #7 and is not recyclable. Also, whether a plastic is recycled differs from place to place. It can even differ per recycling facility in the same country. The original plastic Resin Identification Codes (RICs) were invented in 1988 by an organisation called Society of the Plastics Industry (SPI). The idea was that with a RIC logo the then common types of plastics could easily be distinguished, so plastics could be separated properly. The RIC scheme has been adopted by countries all over the world, but only the numbers 1 to 7 are universal. The meaning of higher numbers varies per country. There is no standard code or logo for composite materials such as a combination of PET and PE and some manufacturers tend to use slightly different logos. 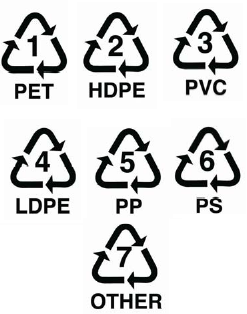 Both PET and PE can theoretically be recycled individually. In fact, PET is one of the most recycled types of plastic. I'm not sure if a PET/PE composite is also recyclable. I suspect this is much more difficult and not economically feasible. If you want to know for sure whether PET/PE is recycled, you'll have to contact your local recycling facility. Bags of cat food are better than recyclable! They are reusable! You know all of those trash bags that you buy? Well, save your empty cat food bags (roll them up tight and find a place to hide them), as they make great trash bags. To seal them up after they are full just fold the top over and use 3-5 staples to secure the fold. Not only do you reuse the feed bag this way, but you also decrease demand on plastic trash bags which means fewer plastic trash bags get manufactured. So using your cat food bag as a trash bag is both a "Reduction" and a "Reuse", both of which are better than "Recycling" which should be the last resort. The same goes for just about any feed bag (Dog, Chicken, Horse, etc). The bags made out of the plastic weave material are also good as rammed earth bags. is a custom symbol probably indicating that the bag consists of PET and PE. Apparently this type of combination is called a PET/PE alloy. Alloying PET and PE doesn’t make economic sense if you start with virgin PET, but it pays off as a use for inexpensive waste streams like colored PET and barrier PET film scrap that normally find only low-value applications or are thrown away. Apparently, alloying gives a way of making recycled PET into a useful product, but it doesn't mean that this product is recyclable. Please ask your local recycling facility if they recycle PET/PE alloys. Not the answer you're looking for? Browse other questions tagged recycling packaging or ask your own question. Is there a cheap, sustainable alternative to newspapers for wrapping food? Is the cardboard from a firework box recyclable? Organic or packaging free food?